- Support for new IDE port on CTPCI and the SWAP of the 2 IDE ports. WARNING, see the fitting documentation because there is an IRQ wire to connect between CTPCI & F030. It is not recommended to use the new port with too old devices (before 1998) that may not support transfers with PIO MODE4. to run together Radeon + NEC USB cards and SDMA+Blitter. - TS delayed of 1 clk : no more limit for high speed higher than 100 Mhz. - Replace ABE Watch dog clk from SDR by F030 clk (16/25Mhz). - New ABE WatchDog timing for PCI MEM & IO on CTPCI : 64us. - Modify TBI decoding : Burst with Move16 is now usable on all expand slot addresses. - New Local Arbiter (previous one was designed in 2003 and never tested !). - Decode BOOT signal in SDR for ABE flash boot : no more need TOS chip on falcon in 060 mode ! Recommended for CT60/63 alone (no add-on board). To program the chips ABE & SDR, you can contact me or buy a JTAG cable to transfer from // port to the chips. This cable exists ready-to-use to many vendors. It will not run as it is on TOS machines. PC software is available free to www.xilinx.com. The name is IMPACT and you will find it in the WEBPACK to be downloaded. To run the cable on your Falcon, you need to modify it : disconnect the wire of pin #13 & connect to the pin #10 of the DB25 connector. You need too to reorganize the order of the wires on the JTAG connector as on the schematics or pinout in the CT60 documentation (in the software pack). Other way : make the cable yourself. Schematics of the cable for TOS (PDF) : Download ZIP file (15 KB). PC version schematics is on Xilinx web site. Solder a 1 to 10K resistor between pin #1 & #10 of one of the three 74LVC245A chips. When launching FLASH060 from 030 mode, NVDI must be running to avoid Blitter to be used by the system ! Now, you will not have to touch the CT...to program from the Falcon // port. Add 2 wires under the CT60 as on the picture below. 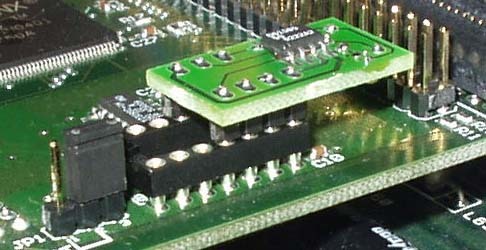 These wires are connecting from I2C bus pins of SDRAM to pins #2 & #3 of the oscillator socket. These modifications concern only the first CT60 (2003). It is obligation for all update of ABE & SDR chip on these CT60. Cut pin #9 of CY2309 and the trace as indicated on the pictures.